United Yacht Sales New Jersey would love to guide you through a personal showing of this 154' Baglietto 48m 2017. This yacht for sale is located in St. Tropez France and priced at $26,900,000. For a showing please contact us by filling out the form on this page and we will get back to you shortly! 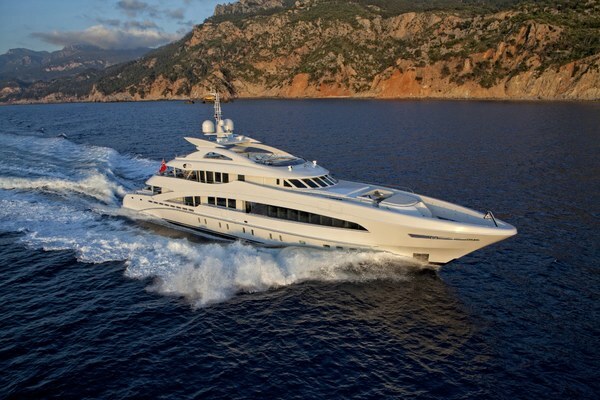 ANDIAMO features a high volume interior with 6 generous staterooms. The full beam Master suite is located aft on the main deck, including a dressing room and two separate bathrooms. The 5 Guest cabins on the lower deck include two doubles, two twin cabins and a VIP forward. The contemporary interior is finished with onyx and lacquered ebony. Amidships is a formal winding staircase in steel and leather which is the central point of the yacht and connecting the three decks. The main salon has comfortable dining and conversation areas, opening out on to the aft deck area through large sliding glass doors. Spacious deck areas include a sun deck with infinity pool and falls, a dining area with bar, BBQ and grill, and comfortable sunbathing forward. On the upper deck is another dining area aft, with two terraces which open on either side of the central cinema room. Crew accommodations for 9 in 5 cabins. Just delivered early summer, ANDIAMO is beautifully designed both exterior and interior by Francesco Paszkowski. Her design brief was for a 48m high volume motoryacht under 500 GT. Very successfully completed, she was awarded the World Yachts Trophies Best Layout and Revelation of the Year at the Cannes Show. The outstanding features of ANDIAMO are a more contemporary design, a much larger beach club, reverse angle windshield at the helm for better visibility, and athwartships tender garage. A 1,500 sq ft sundeck complements the large bridge deck which has two terraces. The master suite is located on the main deck, and three double cabins and two twin cabins with Pullmans are located on the lower deck.